This preseason, Curtis Granderson was hit by a pitch, breaking his forearm, and delivering a severe blow to the Yankee's slim chances to return to the postseason. In mid-August of last season Will Middlebrooks' impressive rookie year was brought to an early end when his wrist was broken after being hit by a pitch. In 2011, Marlon Byrd was drilled in the face by an Alfredo Aceves pitch, causing him to miss six weeks of the season. Watching the video, it seems like he's lucky to be alive. In 2010, John Lindsey had his hand broken by a fastball, ending his season. In 2009, Omar Infante was hit by a pitch, broke his hand, and missed almost three months of the season. In 2005, Adam Greenberg came up for his first major league at bat with the Cubs, was hit in the head by the first pitch he faced, suffered a concussion, and didn't return to the majors until the Marlins honored an online petition and granted Greenberg a one day contract. These are just a few instances from the last decade. Safety equipment has improved, but players are still frequently seriously injured by errant pitches, and we're still not all that far removed from Ray Chapman dying less than a day after being struck by a pitch to the temple. What makes some of these incidents even more depressing is that these examples were accidental, hazards of a game being played by humans which involves throwing a ball upwards of 100 mph just a few feet away from someone's body. The slightest mistake, and the entire body is in danger. Given these obvious extreme risks, I have to question the integrity of any pitcher who intentionally throws at a batter, and the integrity of the league that tolerates this sort of behavior. I'm motivated by a series of two incidents. The first happened in 2011 when Indians pitcher Carlos Carrasco threw at the head of Billy Butler after giving up a grand slam to Melky Cabrera. He was given a six game suspension, which due to Tommy John surgery was not served until the start of this season. 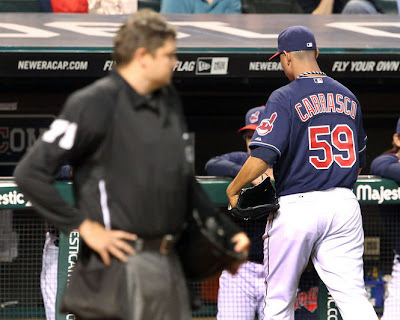 This brings us to the second incident where in Carrasco's first start this season last night, he hit Kevin Youkilis with a pitch right after giving up a home run to Robinson Cano. There are some unwritten rules in baseball which apparently justify hitting a batter. Take too long rounding the bases after a home run, bunt or steal a base in a blowout, be born on a Tuesday, and you can expect to be nailed in your next at bat. Hell, Cole Hamels hit Bryce Harper last season just to welcome him to the league. The real fun comes when it's not even you that has to pay the price for the supposed slight, but the guy that bats behind you in the batting order like in the two Carrasco cases. I don't understand how we got to this point. How is it that in response to someone "showing you up" that a reaction tantamount to assault can just be considered "part of the game?" In what world is it acceptable to throw the kind of temper tantrum that these pitchers throw just because a batter took an extra second to admire an impressive home run? Want to be upset over something real? How about giving up the home run in the first place? Don't attempt to violently injure someone when the person you should really be angry with is yourself. There's something to be said about an eye for an eye, but there is really nothing any batter can do that could possibly justify having a pitch intentionally thrown at him. It isn't like it's even a fair fight. The batter has to just stand there and take it, and if he isn't too crippled after he has to just get up and walk to first base. The real shocking part of all this is that most batters are able to restrain themselves from charging the mound bat in hand. It seems like taking a free shot at the pitcher would come much closer to balancing the scales. So let's eliminate this from baseball. It's childish and petty, but most of all extremely dangerous. Besides, how can it possibly be a good thing for baseball when star players are injured in senseless acts? Wouldn't the Yankees be a lot more marketable with Granderson patrolling center (but preferably left) field? Any pitcher who feels the need to intentionally hit a batter should be ejected and suspended for a lengthy period, I'm thinking at least 50 games. I wouldn't be upset either if criminal action was brought. There are inherent risks in any sport, but intent to injure can begin to fall outside of the domain of the Commissioner's office. Just ask Todd Bertuzzi. I guarantee no one with any sense will miss this from the game. Anyone who needs to prove they're a "real man" can do it within the rules of the sport. Can't abide by the rules of the sport or the law? Then you don't get to participate anymore.